Subject: Revision of Additional Relief on death/disability of Government servants covered under New Pension Scheme (NPS) in pursuance of Government’s decision on the recommendations of the 7th CPC - reg. A copy of Department of Pension and Pensioners’ Welfare (DOP&PW)’s O.M. No. 28/03/2017-P&PW(B) dated 30th May, 2017 on the above cited subject is enclosed for information and compliance. These instructions shall apply mutatis mutandis on the Railways also. Rules 38, 49, 50 and 54 of CCS (Pension) Rules, 1972 and CCS (Extraordinary Pension) Rules, mentioned in DOP&PW’s O.M. 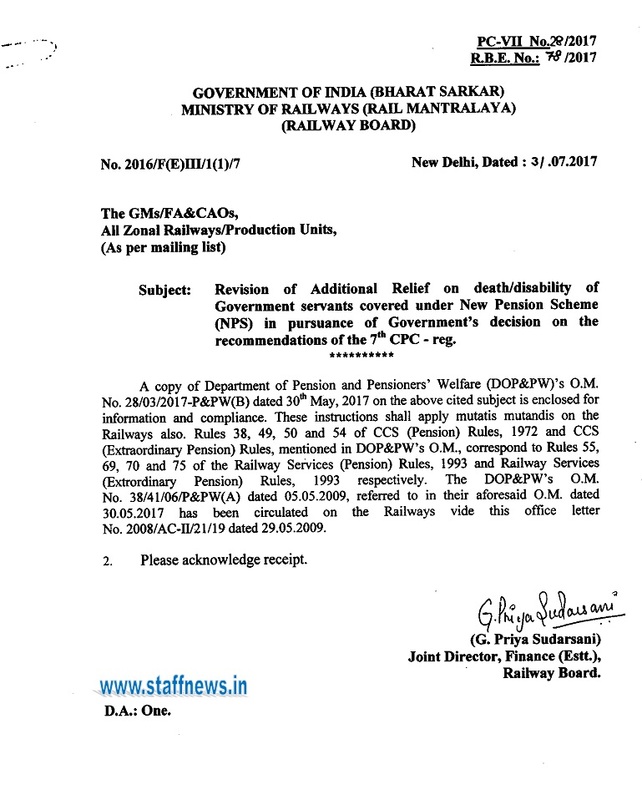 correspond to Rules 55, 69, 70 and 75 of the Railway Services (Pension) Rules, 1993 and Railway Services (Extrordinary Pension) Rules, 1993 respectively. The DOP&PW’s O.M. No. 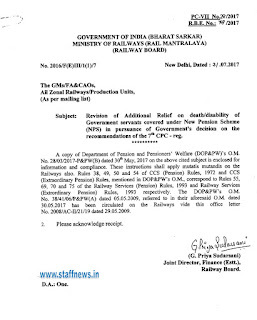 38/41/06/P&PW(A) dated 05.05.2009, referred to in their aforesaid O.M. dated 30.05.2017 has been circulated on the Railways vide this office letter No. 2008/AC-II/2 1/19 dated 29.05.2009.